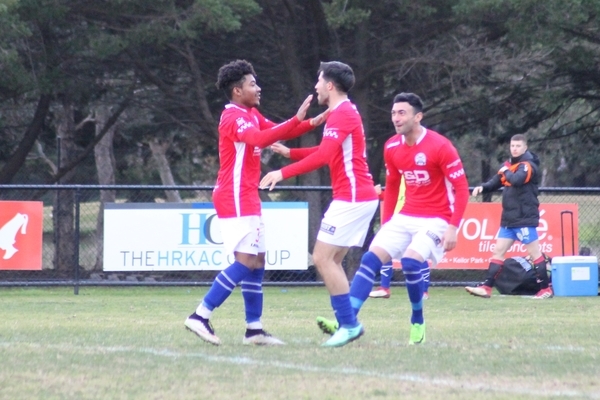 A golden opportunity went begging for North Geelong Warriors last week when a 2-1 lead slipped in the final minutes to end up in a 2-2 draw with Brunswick at home. Despite the slip-up the Warriors maintain their undefeated streak, now stretching to nine games after seven wins and two draws. The next three weeks pits North Geelong against teams that are all promotion aspirants, starting with top-of-the-league Altona Magic at Paisley Park this Saturday night. Altona itself boasts an impressive run in recent weeks, culminating in a 7-1 demolition of Melbourne Victory last week. Previous Geelong SC forward Daniel Kuczynski, now starring for Altona, was in fine form last week, nailing a hat-trick. Jon McShane, now up to 12 goals for the year, will also be an ever-present danger for North Geelong’s back line. Along with defensive concentration, the Warriors will need to work on putting their chances away after failing to capitalise on several opportunities in the first half against Brunswick when they had the ascendancy. North Geelong’s first half was again a well-executed forward-pressing plan. The goals came from Jamie Noggler with a well- taken free kick, giving Seb Mattei no chance of clawing it away from the top corner, and from Darius Madison heading home a Noggler cross into the six-yard area. However, after returning from the break the Warriors were unable to sustain the ascendancy and were overrun in the middle, putting their defence under threat too often. Brunswick kept piling on the pressure and, as the match settled in the dying minutes, Jakub Micak thrust his body forward from a whipped ball-in that bypassed five North Geelong defenders. Micak’s ball slot past Hamish Flavell, tying up the score. With the league’s top teams to take on in the next few weeks, the Warriors have no better time to stand up and show the league their talent.